Riot Fest hit Toronto this past Sunday and brought with a walk down punk memory lane that would make any past Warped Tour fan smitten with joy. With bands from all eras of punk music, from pioneers like NOFX and the Descendents, to local newcomers, Riot Fest brought back that 90's punk feeling that only aggressive lyrics mixed with distorted power chords can provide. The Fort York Garrison Common was the chosen venue for the inaugural Riot Fest Toronto, and while it's a lesser used venue for outdoor concerts, it's certainly one of the best. It was clear from looking at the growing crowd over the day that while they might be getting up there in age, their looks are as fresh as ever. Mohawks and tattoos seemed to be the rule, not the exception, with just about every colour in the rainbow represented on a few heads. Their taste buds must have progressed along with the time, with gourmet poutine, wood-fired pizza, Redbull and Jägermeister rounding out the food and beverage offerings. A trio of local bands, Organ Thieves, Junior Battles and Mockingbird Wish Me Luck, kicked off the event as the half-fill venue continued to absorb the influx of fans. 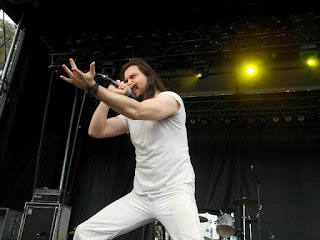 By the time Andrew W.K. hit the stage the crowd was sizable enough to give the venue a packed feel, and just in time too as W.K. clearly wanted to start a party. While he did seem a little out of place in the clearly punk-heavy line-up, W.K. thoroughly entertained the crowd with his constant reminders that "this is not a rock concert, it's a party", and I couldn't help but feel the party vibe when he belted out a modified version of "I Love NYC" which he changed to "I Love Toronto City". The energy continued with the outspoken Lawrence Arms, Florida-ska band Less Than Jake, and a reunited Hot Water Music, which all played with as much enthusiasm as I remember from decades past. Less Than Jake was the stand-out of the bunch with their upbeat music that served as a reminder of how great their music was back in the mid-90's, and it was clear they were enjoying themselves tremendously on stage. Toronto favourites Fucked Up were better than I remember, and lead singer Damian Abraham spent nearly the entire set in the middle of the crowd, encouraging the fans that surrounded him to sing along. By the end of their performance Abraham was mixed so deep in the middle of the crowd it was hard to spot him -- something you rarely if ever see these days. NOFX took the stage and showed Toronto exactly why they're legends of punk, even without the aid of a major record label and minimal promotion. In between studio perfect songs, Fat Mike made a number of jokes to warm up the crowd, including one about their song "Kill All the White Man" which stirred the ire of the outspoken Canadian Immigration Report group, and prompted a "ban NOFX from entering Canada" Facebook page. Even after nearly thirty years, NOFX can still rock the house like very few punk bands can. Despite a large portion of the crowd leaving after NOFX, the night ended with the Descendents playing and excellent set to a visibly tired and muddy crowd. A special 49th birthday cake ceremony for drummer Bill Stevenson rounded out the event which was a nice touch. Overall, Riot Fest Toronto an amazing nostalgic trip down memory lane and proved the punk is still alive and kicking in the city. Being the first ever Riot Fest to come here, let's hope we see a return next year, I know I'll be keeping my spiked collar handy just in case.